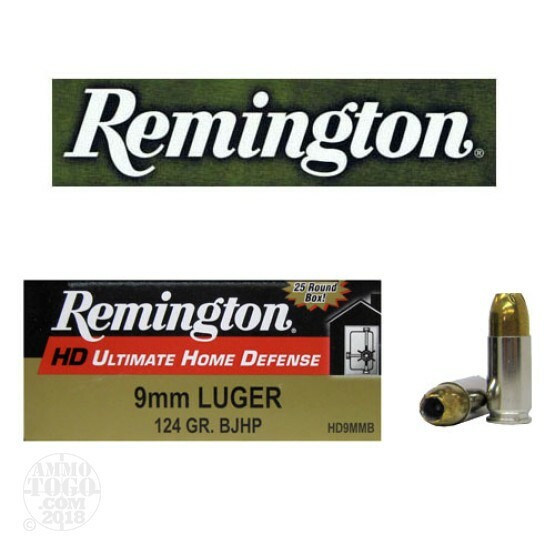 This is 9mm Remington Ultimate Home Defense 124gr. BJHP Ammo. Loaded with Remington's high-performance Brass Jacket Hollow Point (BJHP), these new rounds deliver massive expansion and deep penetration for ultimate stopping power. This round features a premium nickel-plated case that resist corrosion. This dependable hollow point is brass cased, non-corrosive, boxer primed and 100% reloadable. Comes packed in 25rds. per box.